What makes Portugal such a fascinating country? Portugal has long been a favourite vacation destination mainly due to the immense beaches and the 300 annual days of sunshine in which to enjoy them. 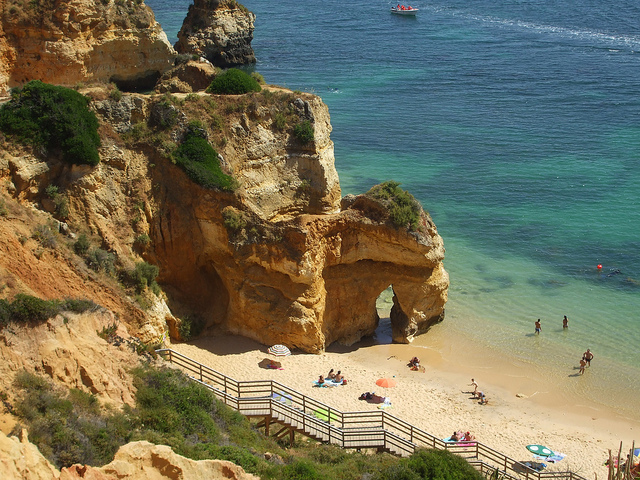 The majority of the millions of visitors this country receives each year tend to make their way to the Algarve but there are also plenty of other places to enjoy sweeping bays, sightseeing activities and a glass or two of that famous wine. You are definitely spoilt for choice when it comes to golden swathes of sand along the beautiful Algarve coastline. These beaches are regarded as not only the prettiest but also the most unspoilt in Europe. The beauty spots along the coast include the miles of idyllic beaches at Faro and the surfer’s favourite of Praia do Amoreira in the west. A great many of the country’s beaches such as Praia do Camilo and Praia do Barril have been awarded the Blue Flag status for cleanliness and for the high standards of facilities available. There are plenty of ancient sightseeing attractions across the country but the most famous is undoubtedly Milreu ruins in Estoi in the Faro region. These extensive Roman ruins comprise of a bathing complex, farming buildings, a temple and many rooms featuring original mosaics; the site dates as far back as the first century AD. The town of Silves is also well worth a visit and the spectacular castle with its 11 towers and Gothic architecture can be explored on a day trip. If you fancy some time away from the beaches then schedule a boat trip to the caves of Algarseco. These weird but magical looking caves and caverns are dotted along the coastal of Portimao, and you can take in the view from the sea as well as exploring inside. Boat trips to the caves will usually include time for a swim and you if you’re lucky you’ll also spot many of the dolphins that inhabit this area. Madeira fortified wine is one of the country’s most famous products and it’s exported and enjoyed around the world. If you’d like to learn some of the history, wine brewing process and perhaps sample a glass or two then head to the Madeira Wine Institute in Funchal. The premises act not only as a quality control centre but also as a museum and it’s one of the most popular tourist attractions. If you’re visiting Funchal during early September you can also enjoy the annual wine festival, which features a parade and traditional folklore entertainment. Port Santo is regarded as an ‘undiscovered’ island just north of Madeira. Undiscovered means it’s only just emerging as a vacation destination but it is destined to become popular thanks to the nine kilometres of powder-soft sands. Vila Baleira is the island capital and it’s a traditional little town that exudes a relaxed atmosphere. A trip to this island definitely means getting away from the bustling crowd and enjoying a more idyllic pace of life. These are just a few of the highlights of this fascinating country but there’s much more to discover if you take the time to explore a little further than the amazing beaches. Radu is an avid traveler, always looking to discover new destinations. He likes to venture off on unbeaten paths and discover hidden gems, that rarely show up in tourist guides.